Last September, in Riga, I met several teacher trainers from the teacher training school of the University of Turku in the Rauma campus. We were working together on an Erasmus project called Assessment Companion for Thinking Skills (A.C.T.S). The three partners come from Latvia, Finland and the UK represented by members of the Let’s Think Forum. and thus increasing student self-efficacy. When they are talking about students they actually mean the student teachers they are training and also the school students they teach. After several discussions, they invited me to come and run some lectures and workshops. So in preparing for a visit, two experiences really nudged my thinking back to an idea that had been bubbling away under my conscious thinking. One was a two hour discussion with Michael Shayer about how to deepen science teacher understanding of the pedagogy of cognitive acceleration (CASE). He talked about how teachers should basically undergo a practical and cognitive apprenticeship through their PGCE years and beyond. This would involve them applying the Curriculum Analysis Taxonomy and the 5 pillars of the existing CASE lessons to develop their own lessons to fit their curriculum. by Nalan Akkuzu (2014). This applied the theories of Albert Bandura and Locke in the context of teacher education in very interesting ways. Digging this out suddenly the idea of how Bandura on self-efficacy and the Vygotskian elements of the Let’s Think methodology are just what we need to explore. I saw that Let’s Think lessons and teacher training sessions already used some of these variables. The experience our group had in Zürich doing our LTE training of developing our own lesson “Feathers”, based on a short film stimulus, seemed to exemplify all of these experiences and certainly increased all of our self-efficacy. It allowed teachers an opportunity to vicariously experience others modify the way the lesson was delivered in a masterful way. Allowed a large number of conversations which persuaded us all of the importance of managing the cognitive conflicts and their resolutions in ways appropriate to the particular class and time the lesson was being used with. This use of verbal/social persuasion is a key element of the social construction episodes of Let’s Think lessons where the teacher mediates using their understanding of the Vygotsky concept of Zone of Proximal Development. Here ZPD is understood as a set of characteristics about the readiness of the group in this particular context. 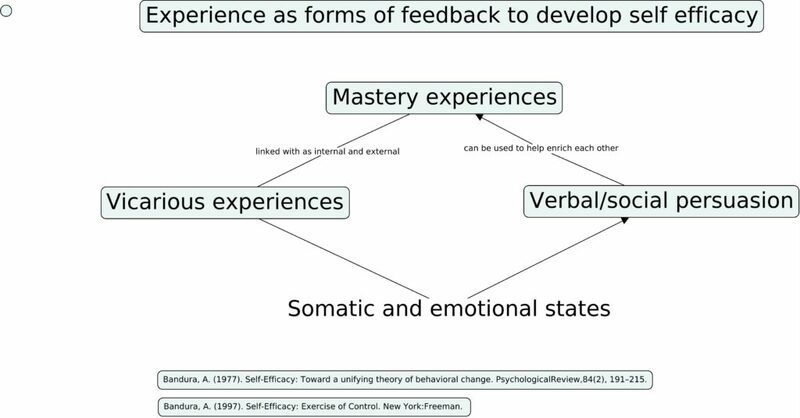 This is where a shared understanding of the theoretical principles of the pedagogy makes it visible in practice and leads to the successful use of experiences as feedback opportunities. A lesson built together by a group of teachers is both a product and a process amenable to the continued uses of the Bandura experiences that will further build efficacy. Kukanauza de Mazeika, J. M. (2001). Effect of different types of feedback during microteaching sessions on preservice teachers. Doctoral Dissertation, New York University, New York. Adey, P and Shayer M (1994) Really Raising Standards, Routledge, London discussed the development and success of the often forgotten and misunderstood programme C.A.S.E. The work they did on the Curriculum Analysis Taxonomy allowed for the development of a series of lessons deeply anchored in domain specific vocabulary, experiences and concepts. The instructional design was in modern parlance to reduce extraneous cognitive load, map and match the intrinsic load and use strongly teacher led activities and discussions to make a range of germane loads available. The goal was to activate the emerging thinking schema needed for successful learning into more abstract objectives. Preparing the mind for new learning. This is why many studies have shown the long and far transfer effects. Michael Shayer and the late Philip Adey published Towards a Science of Science Teaching Cognitive development and curriculum demand in 1981. This was a seminal work for my practice as a young teacher and Head of Science in Leeds in the eighties. Perhaps in a similar way that Cognitive Load Theory is influencing many teachers now. Our action research on the effect of Let’s Think English (LTE) was carried out for a whole school year with grade 5 and 6 classes. We were all trained in the methodology by Michael Walsh, the co-Author of the LTE programmes. The lessons Michael wrote, their delivery and the associated training were all derived from the Cognitive Acceleration through Science Education (C.A.S.E) and Cognitive Acceleration through Mathematics Education (C.A.M.E.) programmes. All three programmes are now called Let’s Think. They are still based on the original methodology but many of the materials have been updated. There is a large active community involved in the further development of materials and training for all 3 programmes across all primary and secondary school ages up to 16. The training we received was highly challenging, interactive and totally consistent with the pedagogy of LTE. It led to a highly pronounced culture of collaborative planning and in depth co-observation, feedback and team teaching. One memorable experience was when Michael demonstrated and then later debriefed the concept of teacher mediation of student reasoning. This was a breakthrough point for Teachers who already considered themselves experienced and fairly expert in developing thinking with their students. This is where the conceptual clarity of the aims of cognitive acceleration programmes gives the most subtle but transformative guidance. The reasoning patterns behind the lessons are the magnetic force that brings the compass of the teacher back to the important direction the discussions should take. An outstanding result of this enhanced awareness of the craft, art and science of teaching was the training day where we applied our understanding to create a Let’s Think lesson. The way all the teachers worked together on the development of a lesson based on a short video called “Feathers” was inspirational. This lesson has been taught in our school many times and constructively commented upon by all the teachers involved in the project. We had the pleasure of presenting this lesson at a LTE Teachers network in Kings College last year. Michael facilitated a series of discussions with teachers spanning the primary age phases on how this lesson could be further adapted. The original research always used Piagetian Science Reasoning Tasks developed by King’s College London to measure changes in cogntive development. These are based on the original clinical interviews conducted by Piaget and his co-workers. They were developed as interactive group tasks to track cognitive levels and subsequent gains across a representative sample of the UK school population in 1976. The changes in cognitive levels are then triangulated and corroborated by independent educational measures e.g G.C.S.E performance or SAT scores. We followed this design but used the ACER tests, as our students do not do SAT or G.C.S.E. 1)The Growth in Piagetian mean reasoning levels shown by the red line in the graph represented a 0.8 effect size (Cohen’s d) N= 59 with a p value of <0.01 for treatment group compared with the mean change blue line shown by a sample of UK students. This sample of N=11,000 was used for control measures in many cognitive acceleration studies. 2) We also used Australian Council for Educational Research (ACER) tests. These use the same scale and psychometric model as the PISA tests. Our students took Mathematical Literacy, Reading, Narrative writing and Expository writing. We used these tests to show the persistence of the cognitive gains and how they would have transfer effects to other subjects or domains more than a year after the start of the intervention. Our students took these ACER test in October 2016 and again in October 2017. For a small sample N=35 (due to student leaving or arriving after the pre and post ACER tests) we got these effect sizes compared to a very stringent control of the top 14 International Baccalaureate schools (N=865) performance on the same tests as reported by Tan and Bibby (2011). Interestingly the growth shown by the lowest quartile of our research sample showed even higher effects on the 4 ACER tests. This effect on the least cognitively developed students has been consistently measured in previous cognitive acceleration research. As a Teacher of IB (Y12 and 13) Biology and Theory of Knowledge in Switzerland I have no dog in any Trad versus Prog fight. Is this just a media invention? I teach about the ideas that science tries to make sense of the Universal and Diverse. I thought about writing a calm considered blog post about this but reading the #nobestwayoverall discussion made me impatient. I am not accusing anyone of affiliation. But this propostiion reminded me of a logical equivalence to the Irreducable Complexity argument of the Intelligent Design criticism against Evolutionary Biology. The claim that teaching and its efficacy is so unknowable because every learner is different and has a different genetic, social history and because every context is different etc would render our profession to be so obviously inferior to say Medicine which has similar individual and contextual historical problems. They are steadily working on the concept of personalised medicine. This concept has many ethical and socio-political problems but not so few knowledge problems. To claim that #nobestwayoverall is true because there is no evidence that says it is not true is no good argument. Where things get difficult is where the human pursuit for understanding expresses itself though for instance philosophy, science, artistic expression, political debate and other forms of persuasion. When it gets difficult we should think harder as Robert Coe asserts. There are good arguments, evidence (from neuroscience, cognitive science and educational psychology). Many of these make coherent, pragmatic and consensus truth forming propositions that support claims that some teaching methods are better than others regardless of contextual variables. Many philosophers of science have agreed on the idea that truth is best understood as the best explanation we have that is consistent with all of the available data we presently have. The concept of nobestwayoverall I think was intended as very laudible alternative and antidote against any dogmatic claim but I reject it as unfalsifiable at worst and at best a barrier to debate. Scientific thinking about Intelligence, Piaget and Vygotsky. Science and free speech has been recently discussed by Steven Pinker. Do we have to be ashamed of discussing how we can increase the intelligence of our students without insult? During the 1970’s Philip Adey and Michael Shayer launched a kind of “State of the Cognitive Union” in the UK. The details of this are to be found in Towards a Science to Science Teaching (1981). Based on a huge sample of school students (aprox. 11000) they found that there was a mismatch bewteen the levels of cognitive development shown in this population and the formal abstract demands of the curriculum. As diligent scientists would do, Adey and Shayer explored how applied Psychology, Educational Research and teaching methodologies could ameliorate this problem. This led to the C.A.S.E, C.A.M.E and now Let’s Think programmes being developed and evaluated in many different contexts. Reading this and their other publications was life changing for me as a just starting Science teacher. A key feature of the whole project of cognitive acceleration, and its replcations that are still thankfully alive, was that “Intelligence is not fixed” and good teaching could play a role. Adey expressed this, to me at an ASE continuing professional development workshop, as letting the “Cognitive Phenotype express the Genotype as Piaget had predicted in his work”. Shayer and Adey , as well as Andreas Demetriou @apdemetriou ‏ , always found the Piagetian theory compelling but were prepared to do the scientific slog work of putting it to rigorous testing. Vygotsky is of course now the modal, but often unread, point of reference. His concept of ZPD, also life changing for me as a teacher, I often cringe at how it is explained and applied. I often find the idea of scaffolding to be far more offensive than the idea of using teacher led strategies to increase the intelligence of students. I really enjoyed the analysis S.J Gould developed in The Mismeasure of Man and appreciate that bad intentioned racists appropriated the concept of intelligence for a good while and that various unjust forms of selection were loosely based on IQ. However a new science based, epigenetic, concept of intelligence may help us open up a new debate. Richard Haier @rjhaier ‏ explicitly points out the stigma that the word “intelligence” has unfortunately gained. 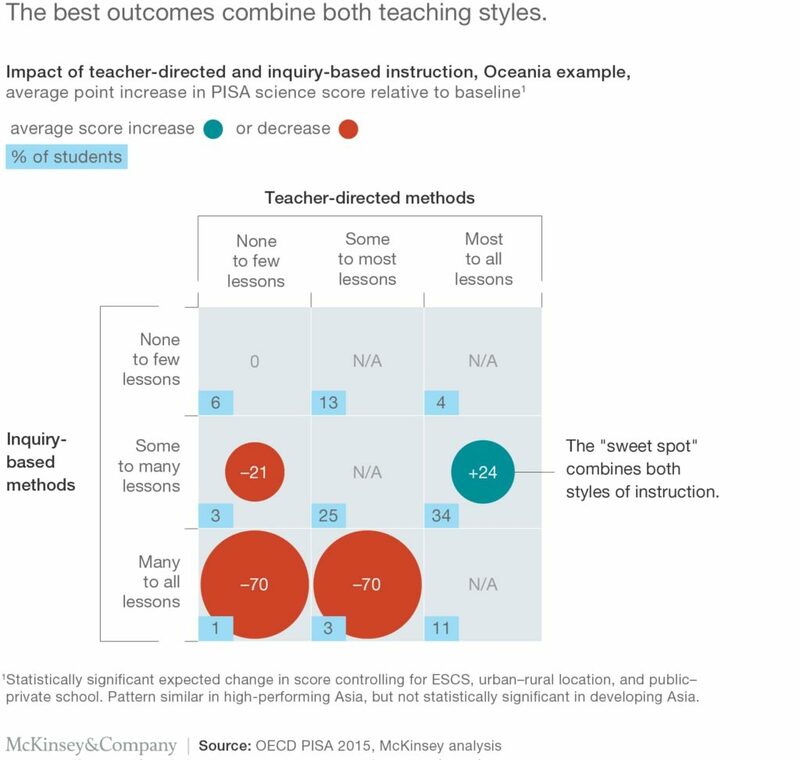 This analysis of the PISA science results seems to give more support for the idea that inquiry based learning is highly problematic unless mediated by teacher leadership. However on closer examination the blend seems to be strongly in favour of teacher led. What a surprise. Is this replication or not? Original Authors or not? 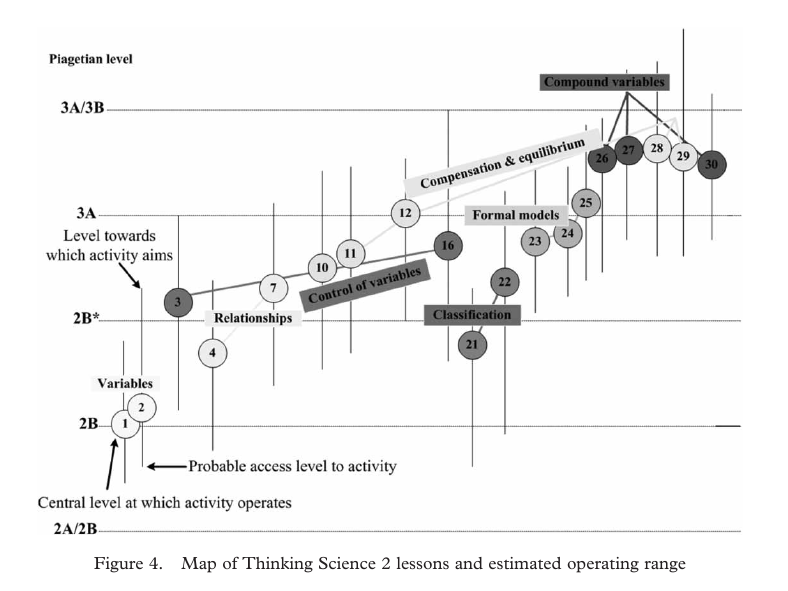 In Finland Hautamäki, Kuusela and Wikström (2002) in one of the first Randomised Controlled Trials ever done in Education, found large gains in Maths and Science. Then there is all the CAME data especially in primary schools in Hammersmith, Fulham and Bournemouth U.K. Shayer and Adhami (20110), Ireland McCormack (2009), Pakistan Iqbal and Shayer (2000) , Israel and in Tonga Finau et al (2016) also replicated. Finau, Teukava & Treagust, David & Won, Mihye & L. Chandrasegaran, A. (2016). Effects of a Mathematics Cognitive Acceleration Program on Student Achievement and Motivation. International Journal of Science and Mathematics Education. . 10.1007/s10763-016-9763-5. Hautamäki, J., Kuusela, J., & Wikström, J. (2002). CASE and CAME in Finland: “The second wave”. Paper presented at 10th International Conference on thinking. Harrogate. McCormack, Lorraine (2009) Cognitive acceleration across the primary-second level transition. PhD thesis, Dublin City University.